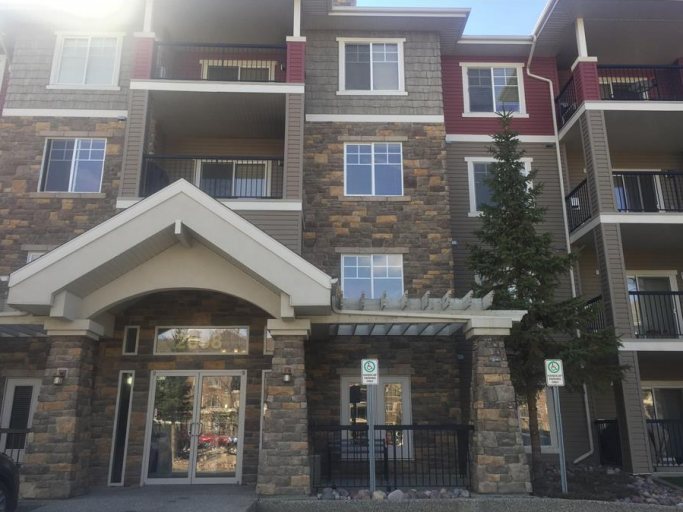 2 Bedroom Condo in Blackmud Creek - Insuite Laundry! The Tradition at Southbrook is located conveniently in Southwest Community of Blackmud Creek. Enjoy easy access to Ellerslie Road, Gateway Boulevard, Calgary Trail and the Anthony Henday Ring Road! Plus within walking distance find grocery stores, restaurants, and various service amenities! Truly a great place to call home! The building itself offers secure entry with key fob system, guest suites for rent, a social and games room complete with a Pool Table, a large fitness area with various equipment and a theater room! Wow! Inside the suite you will find a spacious kitchen with tile flooring, complete with plenty of cupboard and counter space as well as a fridge, stove and even a dishwasher. The large living room pops with its bright paint color and has access to your balcony. There are two bedrooms, the master having its own full bath attached, and another full bathroom. Included in the rent is one reserved underground parking stall, as well as heat and water utilities, meaning you only pay for power!! 2 Bedroom Condo Availability - 2 Bedroom Condo in Blackmud Creek - Insuite Laundry!